The zinc fingers have been divided into several classes according to the number and type of amino acids involved in zinc coordination. Table I summarizes some of the features of the sequences and the function of the more studied zinc finger families. The first class of zinc fingers, called the Cys2-His2 finger motif, is the most abundant DNA binding element in eukaryotes. This motif was first identified in the transcription factor TFIII (Miller et al., 1985, Hanas et al., 1983) and has also been found in transcription factors associated with RNA pol I. Among these, Sp1 from HeLa cells (Dynan and Tijan, 1983; Kadonaga et al., 1987) and Zif268 from mouse (Pavletich and Pabo, 1991) are the most intensively studied. The structure of this zinc finger consists of an a-helix and a b sheet held together by a single zinc atom (Fig. 1A). The zinc fingers recognize specific trinucleotide DNA sequences by insertion of several a-helices in the major groove of the DNA. The CCHH domains are organized in tandem, and the cooperative binding of a-helices contribute to the strength and specificity of the protein-nucleic acid interaction. Figure 1. Ribbon diagrams of the structure of zinc finger domains. A) Transcription factor Sp1 (human, 1SP1) ( Narayan et al., 1997). B) HIV-2 nucleocapsid protein (1NC8) (Kodera et al., 1998). C) Transcription elongation factor TFIIS (human, 1TF1) (Qian et al., 1993a). D) Transcription factor GATA-1 (mouse, 1GNF) (Kowalski et al., 1999). The retroviral nucleocapsid proteins are involved in a variety of functions crucial for the viral life cycle (for review Coffin, 1985; Darlix et al., 1995). These functions include RNA packaging, RNA dimerization, annealing of the tRNA primer to the initiation site of replication and the strand transfer reactions. Most of the retroviral NC proteins contain two conserved CCHC motifs (Gorelick et al., 1988) that coordinate zinc. The exceptions include murine leukemia virus (MLV), which contains a single CCHC structure, and Spumavirus, which lack any CCHC structure. The HIV-1 NCp7 is a 72 amino acids protein containing two zinc fingers separated by seven residues and flanked by two clusters of basic amino acid residues. Research has focused on defining which functions of NC require the CCHC domain and/or the basic regions. NC binds to single strand RNA. Although the zinc fingers of NC are not required for nonspecific RNA interactions (Prats et al., 1988), the first zinc finger of the HIV-1 NC is essential for the selection of virus-specific RNA containing the packaging site in vivo and in vitro (Dorfman et al., 1993, Gorelick et al., 1993; Méric and Goff, 1989). UV cross-linking studies have shown that the protein binds to a small number of sites in the genomic RNA and to a unique site in tRNA (Burd and Dreyfuss, 1994). Deletion of the flanking basic regions of NCp7 has shown that the zinc fingers are necessary and sufficient to promote tRNA annealing (Remy et al., 1998). Replacement of His 23 by Cys in NCp7 resulted in a complete loss of infectivity (Déméné et al., 1994a). In general, mutations that disrupt the 3D structure of the zinc finger domain in NCp7 have the same effect. Similar results have also been reported in the MLV NCp10 (Gorelick et al., 1996). Despite containing wild type levels of full-length RNA, some mutants which exchanged the zinc coordinating amino acids produced non-infectious viral particles due to impaired reverse transcription (Gorelick et al., 1996). The structure of NCp7 of HIV-1 (Morellet et al., 1992; South and Summers, 1993; Déméné et al., 1994a ) and NCp10 of M MuLV (Déméné et al., 1994b) have been solved. Both structures are characterized by a well-defined central zinc finger flanked by flexible N- and C-terminal domains (Fig. 1B). The structure of a complex of NCp10 with the oligonucleotide d(ACGCC) reveals that the finger provides a surface for binding the nucleic acid through hydrophobic interactions and the stacking of Trp35 between the G3 and C4 bases (Schuler et al., 1999). Studies of the NCp7-d(ACGCC) complex showed a similar complex where a Trp in the second finger is stacked between C2 and G3 of NCp7 (Morellet et al., 1998). Proteins containing the Cys4 finger motif are found in enzymes involved in DNA replication and transcription. Primases in phages T4 and T7 recognize specific trinucleotides of single stranded DNA (Cha and Alberts, 1986), whereas factor TFIIS interacts with ss DNA (Qian et al., 1993a), ds DNA and RNA (Agarwal et al., 1991). The structure of the zinc finger domains of factors TFIIS and TFIIB (Fig. 1C) have little in common with other zinc binding domains because their structures are almost entirely a b-sheet (Qian et al., 1993a, 1993 b). The T7 primase/ helicase contains a Cys4 motif responsible for primer synthesis, which recognizes the sequence 5' GTC 3'. Removal or disruption of this motif is sufficient to destroy recognition, however, the Cys4 motif may not be the sole determinant for specificity (Hine and Richardson, 1994; Kusakabe and Richardson, 1996; Kusakabe et al., 1999). The GATA family of transcription factors regulate gene expression in diverse tissues during development. GATA-1 is involved in the regulation of red cell development (Orkin, 1992; Weiss et al., 1994); GATA-2 and 3 also play a role in hematopoiesis (Ting et al., 1996; Tsai et al., 1994). GATA-1 contains two Cys4 fingers: The C-zinc finger is involved in DNA binding and recognizes the (A/T)GATA(A/G) DNA motif. The N-zinc finger, however, does not bind DNA directly, but appears to modulate DNA binding by the C-zinc finger through interaction with other transcription factors (Mackay et al., 1998). GATA-2 and 3 are capable of strong binding to the sequence GATC (Pedone et al., 1997). This binding requires two basic sequences at either side of the N-terminal finger. One of these sequences is not present adjacent to the GATA-1 N-terminal finger and could explain its lack of DNA binding (Pedone et al., 1997). These observations suggest that isolated zinc fingers that do not show direct binding to nucleic acids may interact with sequences outside the finger or present in other factors. The structure of the N-zinc finger of GATA-1 is shown in Figure 1D. The yeast protein GAL4 activates transcription of genes involved in the utilization of galactose and melibiose. The protein is a monomer in the absence of DNA. However, it binds DNA as a symmetrical dimer to a 17 base pair sequence (Carey et al., 1989). Each subunit has a compact zinc finger domain (Fig. 1E), which lies in the major groove where it contacts a CCG triplet. This triplet is at each end of a symmetrical 17 base pair DNA fragment recognized by GAL4 (Marmorstein et al., 1992). The DNA binding region has 6 cysteine residues that coordinate two zinc ions. The protein also contains an a-helical dimerization element (Carey et al., 1989). E) Transcription regulator factor Gal4 (yeast, 1AW6) (Baleja et al., 1997). F) Retinoic X receptor (human, 1RXR) (Holmbeck et al., 1998). G) Equine Herpes virus type 1 gene 63 (1CHC) (Barlow et al., 1994). Intracellular receptor proteins, such as the estrogen, glucocorticoid and retinoic X receptors, bind to two hexamer sequences which form the hormone response elements (Mangelsdorf and Evans, 1995). DNA binding requires dimerization of the Cys8 motifs ( Mangeldorf et al., 1995). The structure of the zinc finger domain of the retinoic X receptor is shown in Figure 1F. It consists of two separate loop-helix structures that coordinate a zinc ion; the a- helices from each loop-helix structure are packed perpendicular to each other (Holmbeck et al., 1998). This packing is the common feature of the nuclear hormone receptor DNA-binding domains. In response to retinoic acid, the protein dimerizes in a head-to-tail fashion to bind DNA (Mangeldorf et al., 1995). Heterodimers are also formed with other nuclear receptors, including the thyroid receptor (TR) and vitamin D receptor (VDR). The RING fingers, or Cys3HisCys4 motif, comprise several proteins of diverse origins (Freemont et al., 1991; for review Borden, 2000). These include Rad5 from yeast, which is involved in DNA repair (Johnson et al., 1992) and RAG1, essential for immunoglobulin rearrangements. The structure of the RING finger motifs of three proteins have been determined to be equine herpes virus type 1 gene 63 peptide (Barlow et al., 1994), human promyelocytic leukemia protein, PML (Borden et al., 1995) and the human RAG1 (Bellon et al., 1997). The RING domain structure consists of two b-sheets, an a-helix and two symmetrical loops (Fig. 1G). Two zinc ions are coordinated by this motif. Direct DNA binding has not been shown for this protein. Ring finger domains have been implicated in the regulation of several cellular processes through protein-protein interactions such as transcription, RNA transport, signal transduction, and ubiquitination among others (reviewed by Saurin et al., 1996). The RING domains appear to act as building blocks by forming molecular scaffolds of multiprotein complexes whose function is RING-dependent (Borden, 2000). The HHCC domain is a highly conserved zinc binding motif found in retrovirus and retrotransposon integrases (Johnson et al., 1986; Burke et al., 1992, reviewed by Brown, 1997). Sequence comparison of several integrases suggested that the HHCC domains might constitute a novel type of zinc finger (Johnson et al., 1986). Spectroscopical analysis of isolated peptides containing the HHCC domain of HIV-1 (Burke et al., 1992, Zheng et al., 1996) and M-MuLV (Yang et al., 1999) integrases has shown that zinc binding changes the protein conformation. Physical evidence for the coordination of zinc by the cysteines in the HHCC domain of MuLV IN has been shown by the lack of reactivity against NEM (Yang et al., 1999). The 3D structure of a 55 amino acid N-terminal HHCC domain of HIV-1 has been solved by NMR (Cai et al., 1997). The protein is dimeric and the structure of the monomer (Fig. 1H) comprises four helices. The zinc atom is coordinated by the residues His 12, His 16, Cys 40 and Cys 43. The protein is found in two interconverting conformations that differ in the coordination of His 12, which causes a local unfolding of the region 9-18. The dimer interface is formed by the packing of the N-terminus of helix 1, and helices 3 and 4. Although the folding of this domain is remarkably similar to DNA binding proteins, such as the Trp repressor, the second helix is involved in dimerization rather than DNA recognition. This observation, however, does not exclude the possibility of the dissociation of the dimer during the recognition of the viral LTR by IN or multimerization during the assembly of the integration complex, allowing helix 2 to participate in DNA binding. Using both nitrocellulose filter binding assays and DNA bound to a Biacore chip, DNA binding by an isolated M-MuLV HHCC domain could, in fact, be observed (F. Yang and M. Roth, unpublished observations). The HHCC domain is essential for the integrase activity in vitro (Jonsson and Roth, 1993; van Gent et al., 1992; Ellison et al., 1995; Khan et al., 1991; Drelich et al., 1992). Several types of mutations in the finger region also blocked in vivo integration (Roth et al., 1990; Cannon et al., 1994; Engelman et al., 1995; Donehower, 1988). In the process of integration, termini with a 5' overhang are generated. In vitro, substrates lacking this 5' tail require the presence of an HHCC domain (Donzella et al., 1996; Donzella et al., 1998). Complementation and other studies support the notion that the HHCC domain is involved in protein-protein interactions as will be discussed below. The ability of the zinc fingers to recognize three base pairs has led to an intense exploration on the design and selection of domains that control the expression of specific genes. Structural information based on X-ray crystallography and NMR has guided these studies. Site-directed mutagenesis and phage display selections have contributed to our knowledge on interactions between the zinc fingers and target sites. The crystal structures of zinc finger-DNA complexes show a semi-conserved pattern of interactions between three amino acids from the a-helix and three nucleotides within the DNA. A large collection of mutants have been displayed on the surfaces of bacteriophage, allowing their selection using specific DNA sequences (Choo and Klug, 1994; Wu et al., 1995; Greisman and Pabo, 1997). In this procedure the mutated zinc finger domains are expressed as fused peptides on the phage capsid. Phages displaying the peptides can be captured in a support coated with specific DNA and amplified for further selection rounds. From these studies, coding relationships between protein and nucleic acids have been implicated (Desjarlais and Berg, 1992). Segal et al. (1999) used phage display to select Zif268 finger-2 domains from randomized libraries that recognize sequences of the type 5' GNN 3'. These studies showed the limitations of relying on selection data and previous structures in defining the features involved in specificity. Changes in amino acids at positions not in direct contact with DNA may influence specificity, limiting the applications of recognition codes previously described (Desjarlais and Berg, 1992; Choo and Klug, 1994; Choo and Klug, 1997). However, further studies are needed to understand the recognition of DNA by zinc fingers. A general strategy to produce gene switches has been developed by fusion of polydactyl zinc finger proteins with desired sequence specificity (9 or 18 nucleotides long) to either an activator or repressor protein (Beerli et al., 1998). This approach overcomes the problem of target overlap observed by targeting trinucleotidic sites by individual fingers. In vivo studies demonstrated that the fusion of the Kruppel associated box (KRAB) to a polydactyl finger protein was able to repress transcription from the erbB-2 promoter, whereas the fusion of the activator domain VP16 or VP64 (a tetrameric repeat of VP16) stimulates transcription by 5 and 25-fold respectively. Development of highly specific zinc fingers by selection procedures directed toward specific sequences in the genome could result in the generation of site-directed control proteins. Targeted gene control has broad applications. These could be developed to generate specific antiviral or antitumoral molecules, to activate genes involved in the defense against diseases, gene "knockouts" to characterize genes of unknown functions and gene therapy, through the inhibition of genes producing mutated proteins. RNA-protein recognition is essential in critical steps of many cellular processes, such as RNA synthesis, processing and translation. Our current knowledge of RNA-protein interactions is very limited in contrast to that of DNA-protein interactions, for which several models are available. Some zinc finger motifs are known to interact with RNA, such as the retroviral NC protein. The details of the recognition of others have not been fully investigated (Joho et al., 1990; Theunissen et al., 1992; Clemens et al., 1993; Friesen and Darby 1997, 1998). Recently the interaction between Zif268 and DNA molecules having an RNA triplet in the middle of the DNA binding region has been studied by phage display, computer modeling and NMR (Blancafort et al., 1999). The introduction of a G::A mismatch in the middle position of the RNA triplet allowed the selection of an RNA binding zinc finger. The zinc finger binds the rG::A duplex in a head-to-head conformation. A long side chain at position +3, either Lys or Arg, compensated a shift in the minor groove of the G::A pair. The structural role of purine-purine pairs has also been described in the Rev binding element of HIV. 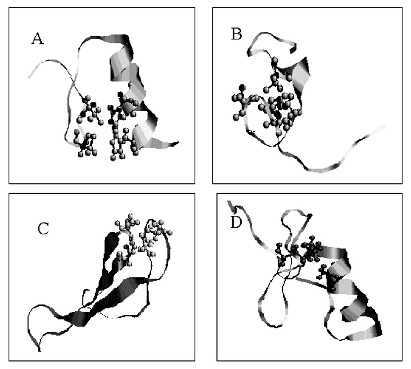 In this case, the G::A and G::G widen the RNA major groove for protein binding (Battiste et al., 1996). McColl et al. 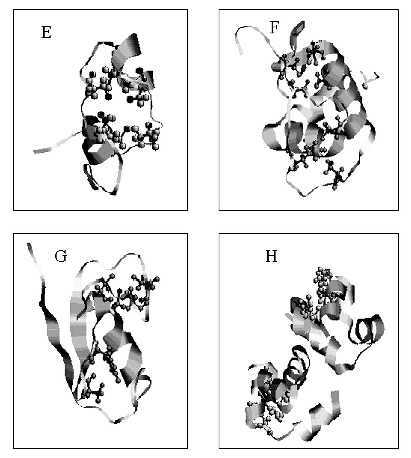 (1999) designed a hybrid protein containing the arginine rich region from HIV-Rev into the zinc finger-2 domain of Zif268. This construct was able to bind specifically to the Rev Response Element, providing evidence that monomeric zinc fingers recognize specific sites on RNA. There are several examples of zinc finger domains that do not bind nucleic acids, however they are involved in protein-protein interactions (Crossley et al., 1995; Merika and Orkin, 1995; Tsang et al., 1998; Feng et al., 1998; Sun et al., 1996; Borden, 2000). These protein-protein interactions could be homotypic, such as in protein multimerization, or heterotypic, involving the cooperative interaction with a large variety of factors (i.e. coactivators, corepressors, and other control elements) associated with transcriptional control of a group of genes. One example is the transcription factor GATA-1, which can self-associate but its N-finger also interacts with FOG (Fox et al., 1998), Sp1, and EKLF (Tsang et al., 1998). In vivo studies have shown that the N-finger of GATA-1 is essential for erythroid maturation (Weiss et al., 1997). The interaction in both cases is dependent on the integrity of the zinc coordinating residues. Self-association of GATA-1 requires the N-finger, however this finger directly interacts with the C-finger domain of the protein, presumably in an anti-parallel fashion NF-CF, CF-NF (Mackay et al., 1998). A critical binding region in NF containing a "Asn-Arg-Pro-Leu" motif followed by a number of basic residues has been delineated by mutagenesis. The association of the NF of GATA-1 with FOG (Fox et al., 1998) also involves conserved key residues within GATA-1. The biological role of this intermolecular interaction is not certain, although multimerization increases the local concentration of GATA-1 at the activation site. Previous in vitro studies have shown that the N-terminal HHCC domain of the retroviral integrase is essential for the 3' processing of the viral LTRs (reviewed by Brown 1997). Thus, it is clear that the one of the functions of the HHCC domain is to participate in the assembly of the integration complex, which requires the concerted binding of the processed viral ends and the target DNA. In this process it is likely that conformational changes of the protein multimer, including intra- and intermolecular associations must take place. The HHCC-dependent multimerization may be important in the stabilization of viral ends (Ellison et al., 1995). In the presence of Zn+2, the HIV-1 IN multimerizes from a dimer to a tetramer (Zheng et al., 1996). The observation that the HHCC domain MuLV IN is critical for the unimolecular disintegration of a substrate lacking the 5'ss tail suggests a role for this domain on the stabilization of the LTR (Donzella et al., 1998) within this complex. This recognition can be indirect, as has been observed in other zinc fingers that show DNA binding only in the context of other protein domains. Zinc fingers, as a general term, in fact include multiple distinct structures with the common denomination that they require zinc coordination for their formation. These structural motifs are involved in a broad range of biological activities including ds DNA binding, ss DNA, and RNA recognition, as well as coordinating protein-protein interactions. With the sequencing of the human genome, the identification of additional proteins encoding zinc fingers is inevitable. The key now lies in understanding their functions. Understanding the rules for sequence recognition has broad implications in the development of targeted proteins. This work was supported by grants from FONDECYT [1980982 (OL) and 1RO1 CA76545] and from the NIH (MR). Corresponding author: Oscar Leon. Instituto de Bioquímica, Facultad de Ciencias Universidad Austral de Chile, Casilla 567, Valdivia, Chile .Telephone: (56-63) 22 1332. E-mail: oleon@uach.cl. Received: May 3, 2000. Accepted: May 19, 2000.